If I didn’t find my calling as The Pond Guy it most certainly would have been working in some capacity with kids. I love kids! Blake 15 and Jack 16 both remind me of myself when I was their ages. They’ve built their own personal ponds and found their way to Aquascape respectively. 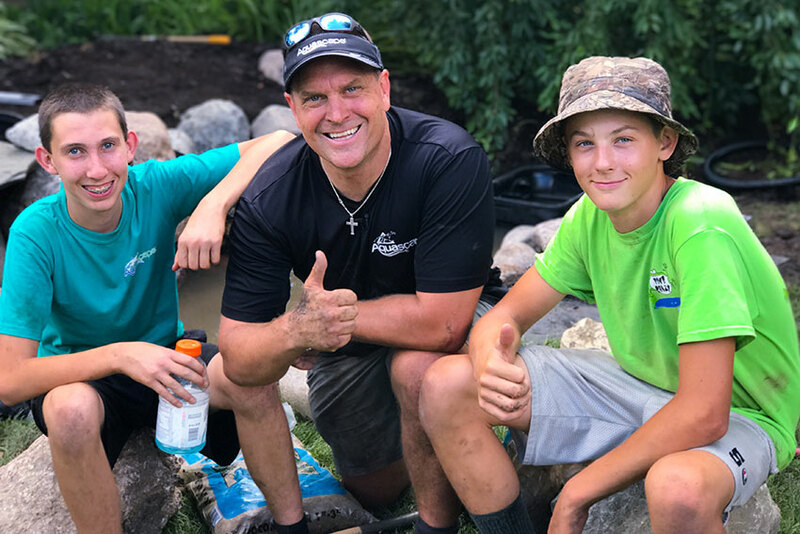 Together we just built a pond for another 16 years old introducing a new kid to the same passion we all have! When I’m long gone hopefully many years from now either they or others like them will be carrying on what I’m doing today. If you think about it every younger generation will be carrying on what we’re all doing today. It might not look the same, the future has a way of changing how things get done, but the point remains, it’s up to future generations to do what each of us is responsible for today. When you look at things that way we all have no choice but to be coaches to those generations behind us. Kids deserve our attention now, and the better we do at coaching them when they’re young, ultimately the better we will have it when we’re old. If being a coach isn’t really a choice than we might as well choose to be good ones. Look for teachable moments, have the patience to be patient (always my biggest struggle) and look for opportunities to share your unique knowledge often with those who can benefit from your passion. None of us want to get old but we all inevitably will. Working with kids though might just have the additional reward of keeping us younger longer!